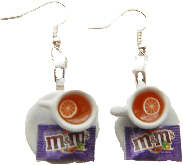 Trendy lemon tea and m&m sweet tea cup earrings handmade from clay. * Please note: There could be slight variations in production design due to the handmade nature of this product. Sterling silver option also available.